Tired of tripping over shoes at the front door? 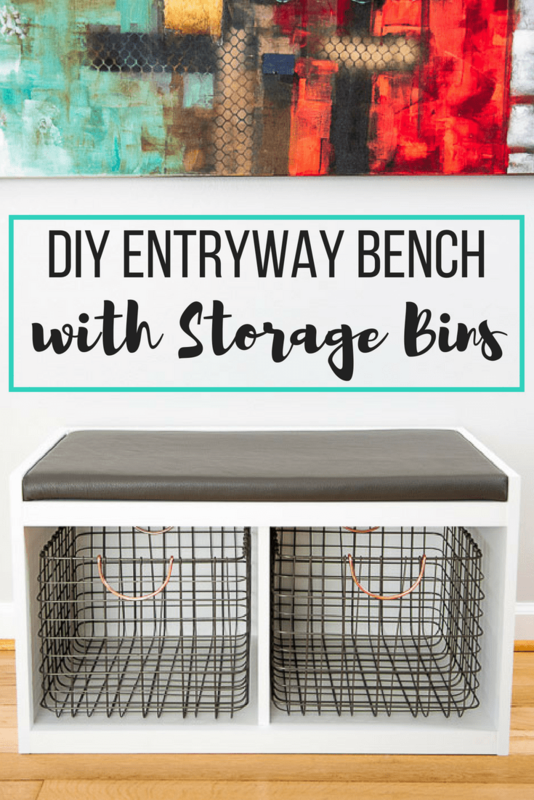 This DIY entryway bench with storage bins is the perfect solution! 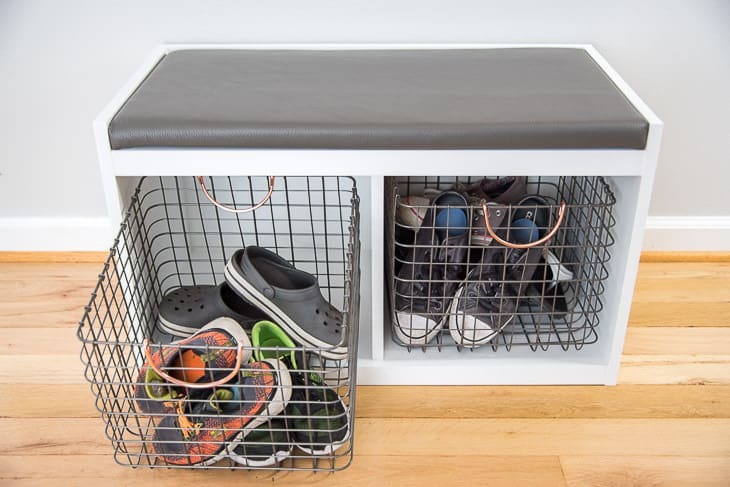 The upholstered top provides seating while you remove your shoes, and the storage bins below hold plenty of pairs. Our entryway is always a cluttered mess! There’s an overflowing basket for shoes, but nowhere to sit and put them on. But not anymore! 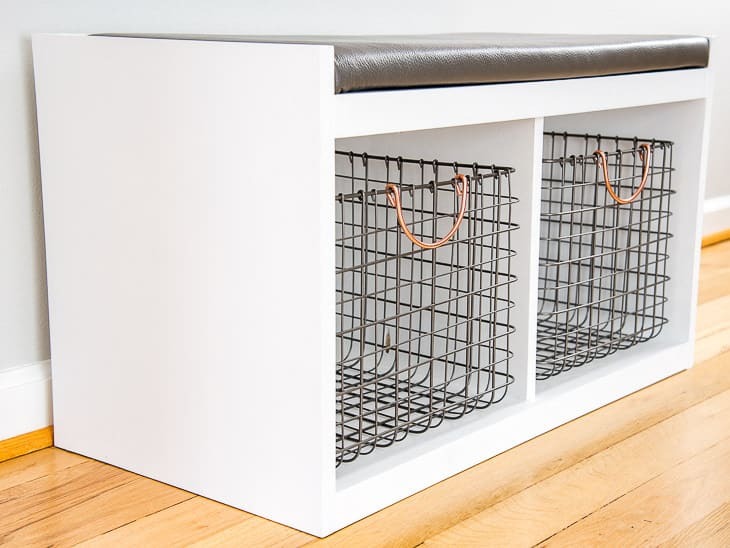 This DIY entryway bench gives us the seating we need by the front door, and these industrial metal storage bins hold all the shoes for the entire family in one place. This post is sponsored by Leather Hide Store and contains affiliate links for your convenience. Purchases made through these links may earn me a small commission at no additional cost to you. Sometimes I stumble upon a single object that becomes the inspiration for an entire piece of furniture. 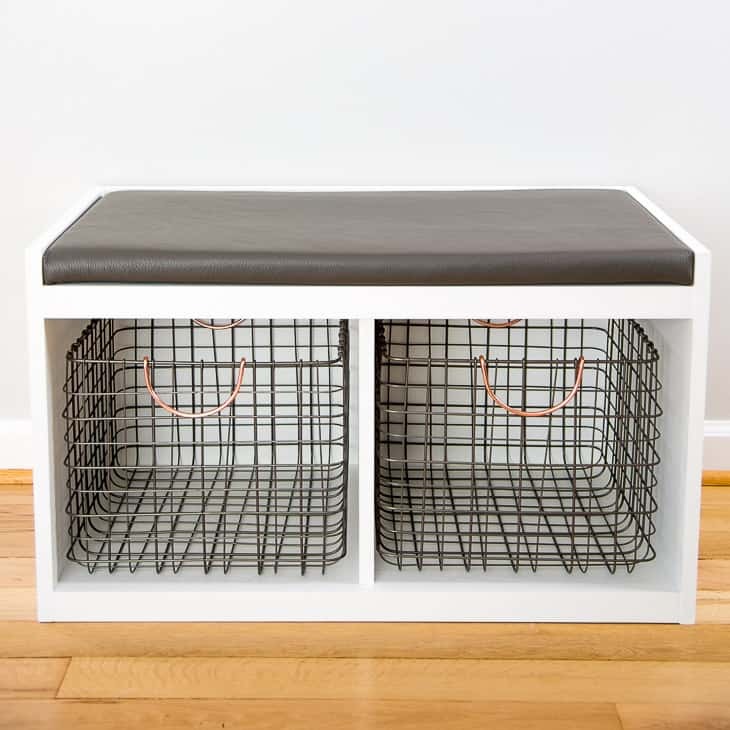 In the case of this DIY entryway bench, these industrial metal bins from Target just jumped into my shopping cart and demanded to be incorporated into my living room! I shared this little sneak peek of this project over on Instagram last week. The antique pewter color coordinates perfectly with the gray leather from Leather Hide Store I had left over from my DIY ottoman project. The front door is behind the couch, which creates an entryway area in the living room. Using the same gorgeous leather for both projects brings the whole room together! I used preprimed 1 x 2 trim board left over from my fireplace remodel. You can also get the cuts made for you at the home improvement store. 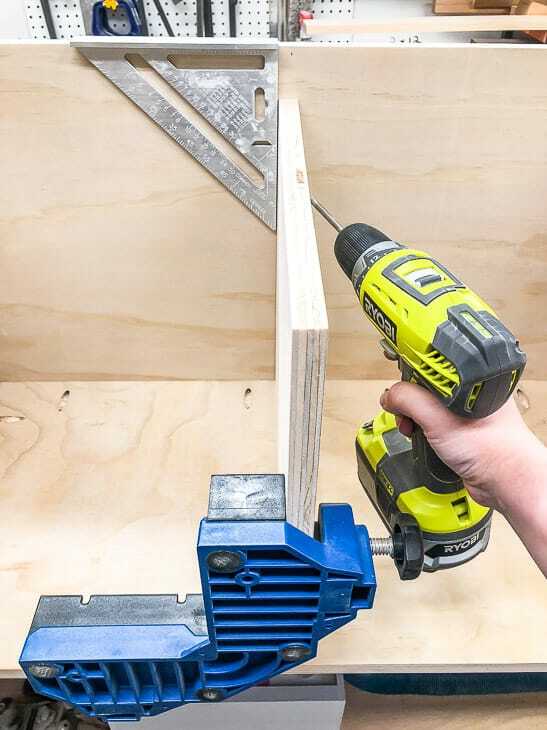 If you’ve never used one before, here’s my overview of how to use a Kreg Jig and a comparison of the different models. The Ryobi Airstrike is one of my favorite tools! 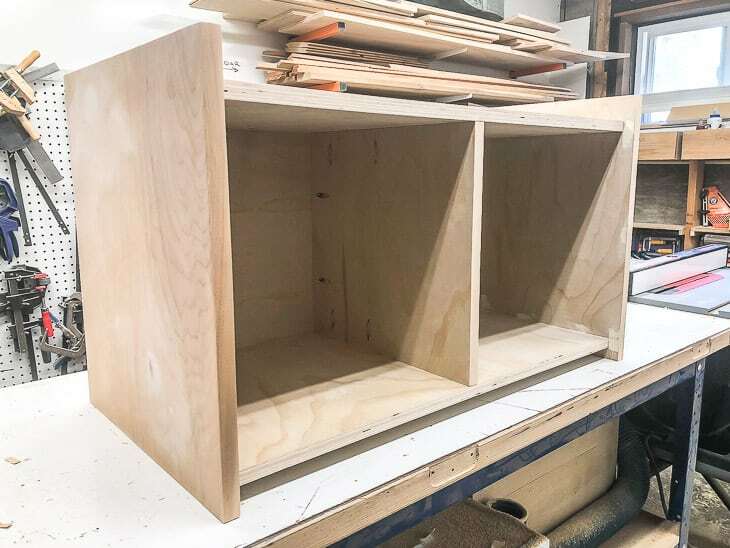 This bench is custom sized to these storage bins, which measure 11″ high, 13″ wide and 14″ deep. If you use different bins, you may need to adjust the dimensions to fit. 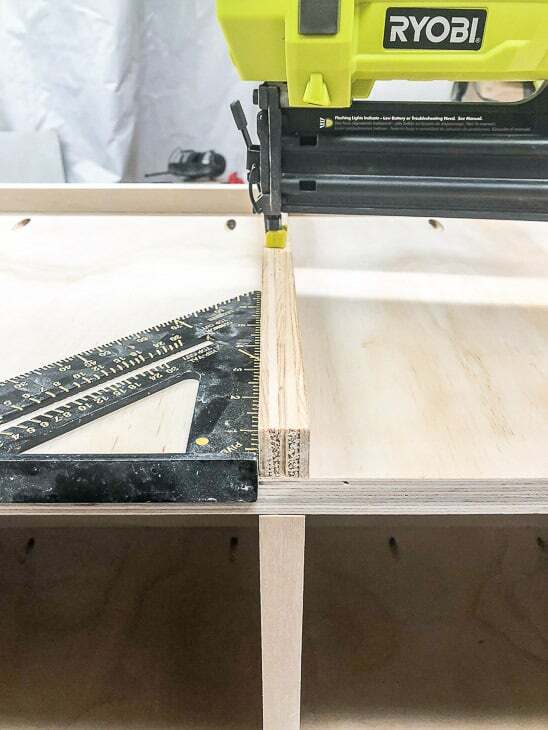 Cut your 1 x 2 trim board as follows (you may want to wait and cut them to size once the bench has been built). 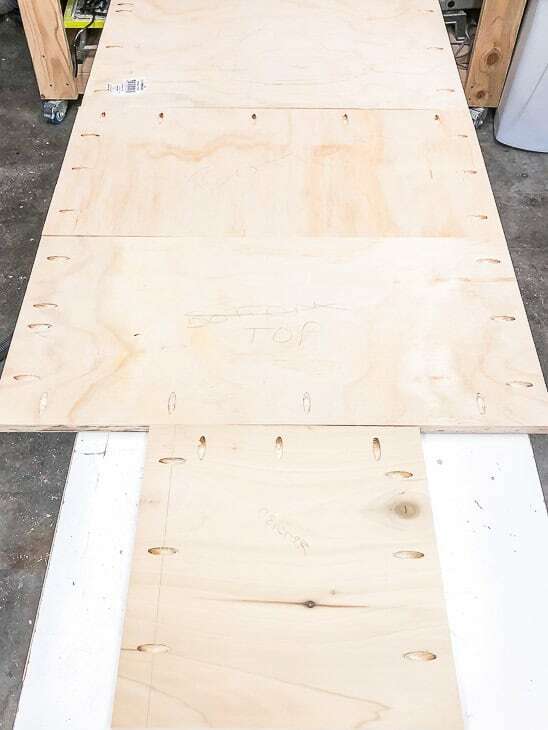 The 1/4″ plywood for the cushion backing is 29 1/4″ x 15 1/4″. First, read my ultimate guide to pocket holes if you aren’t familiar with the process. 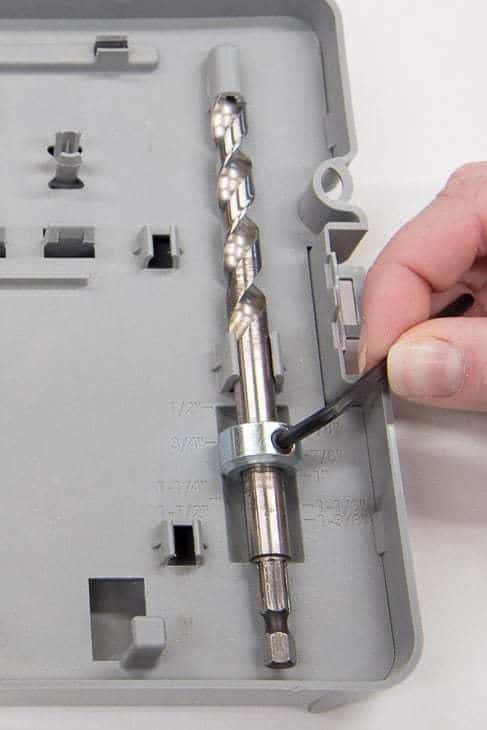 One additional tip for this project: Set your pocket hole drill bit for slightly less than 3/4″. 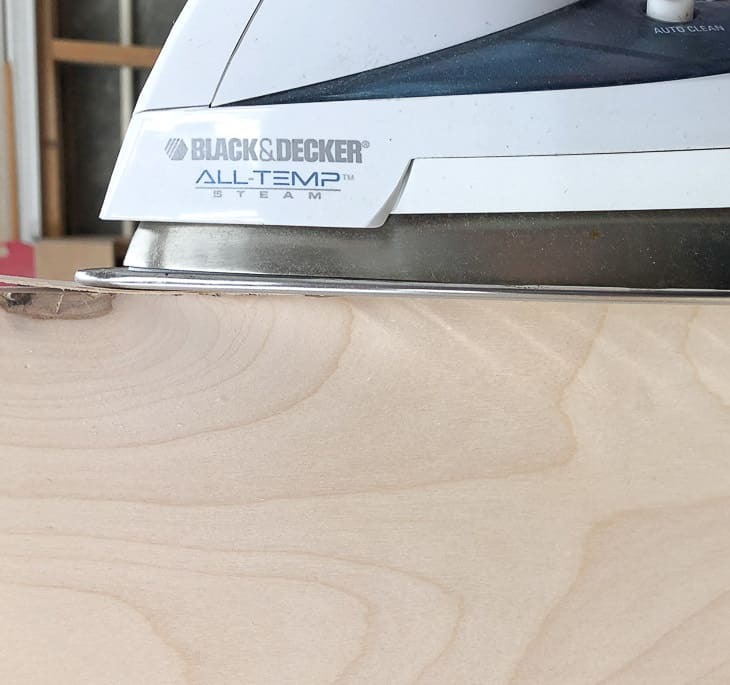 Plywood is a tiny bit thinner than 3/4″, and you don’t want your screws poking through! Drill pocket holes down the short sides of the back piece, and along three sides of the top and bottom piece. At the same time, drill pocket holes along three sides of the center support. If you’re not planning to plug the holes later on, you’ll want to avoid putting one close to the front edge where it will be visible. 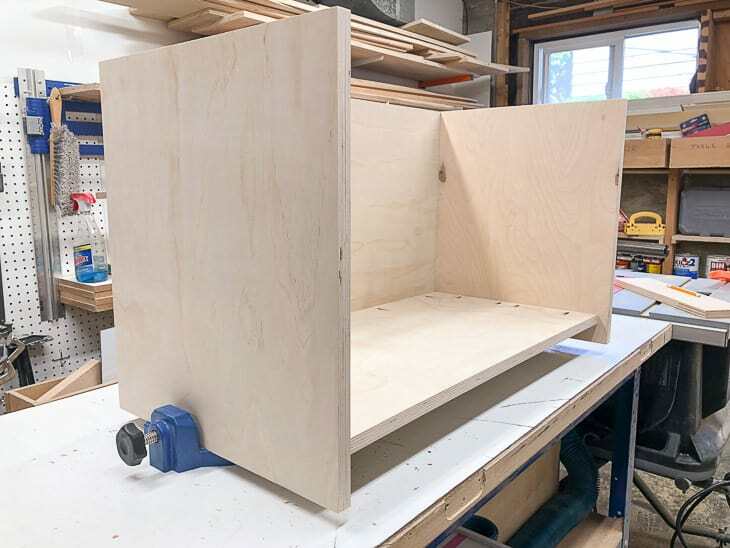 Some of the plywood edges will be exposed after assembling the bench. I decided to cover these ends with edge banding. First, check out my tutorial on how to apply edge banding. Basically, you just iron it on, then trim the edges away! It’s a lot easier to do the edge banding before assembling the bench. 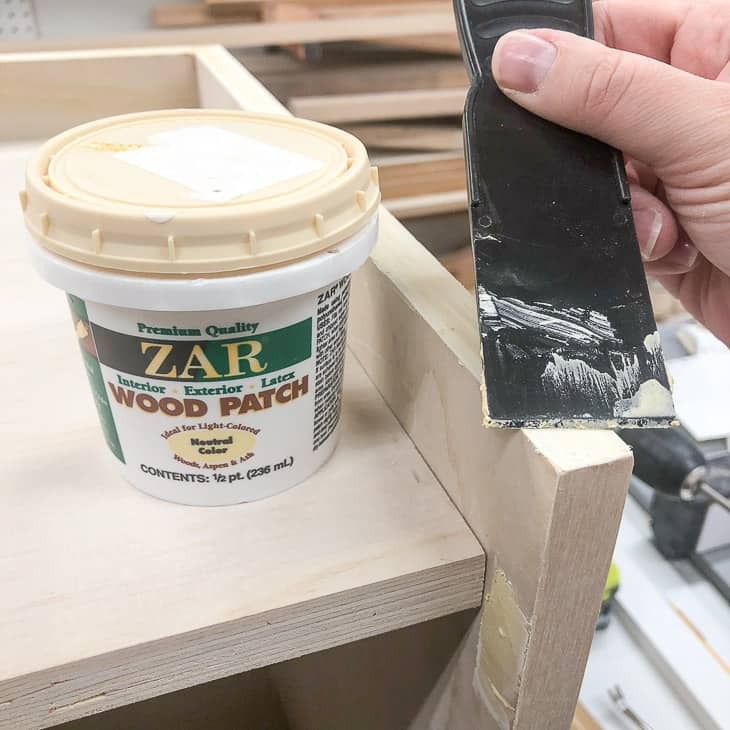 You can also apply wood filler and sand it smooth later on in the process. 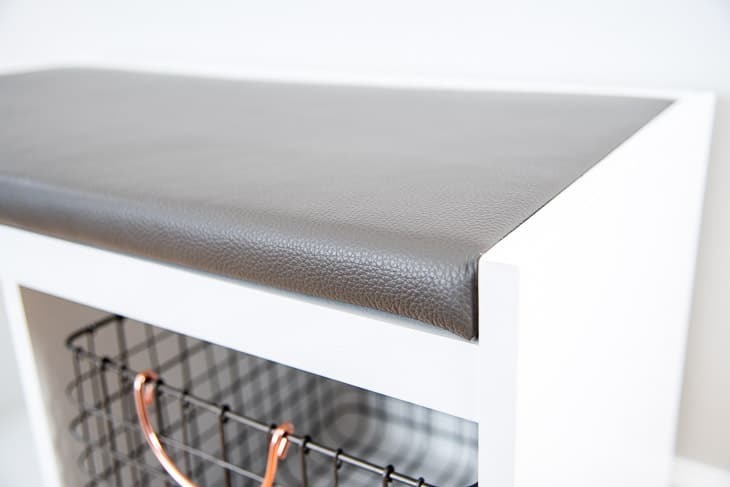 Start by attaching the back of the bench to the sides with 1 1/4″ pocket hole screws. I used these corner clamps to keep everything square while I inserted the screws. They’re like another pair of hands! Next, attach the bottom piece 1 1/2″ up from the bottom of the side pieces. Ignore the fact that my pocket holes are facing the wrong way! I installed the top before the bottom, but it’s actually easier the other way around. Now, mark the middle line of the interior and install the center piece. I used the corner clamps again to hold it upright, and a square hanging from the top to make sure it went in perfectly straight. Finally, screw the top in place. It should rest on top of the center divider and be level on both sides. Flip the entire thing over and attach the 14 1/2″ trim board underneath the center piece (I used a scrap of plywood cut to 3/4″ instead). This will provide support for the center of the bench. 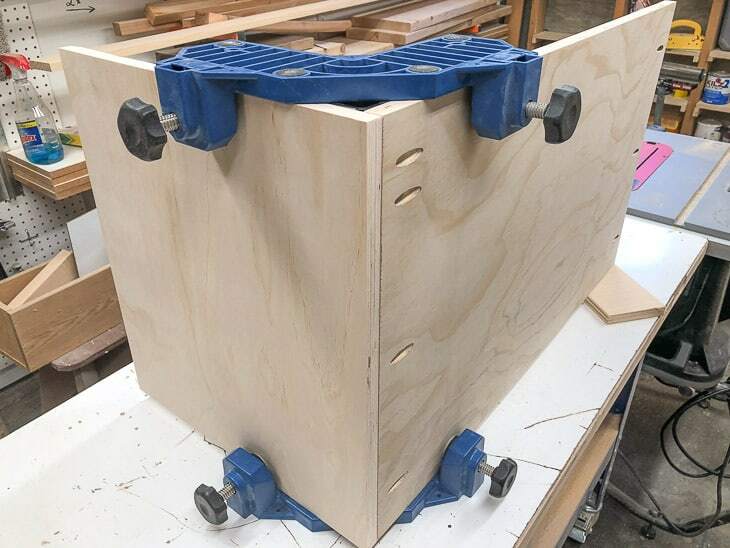 If you want additional support at the sides, you can add supporting boards to the back corners. 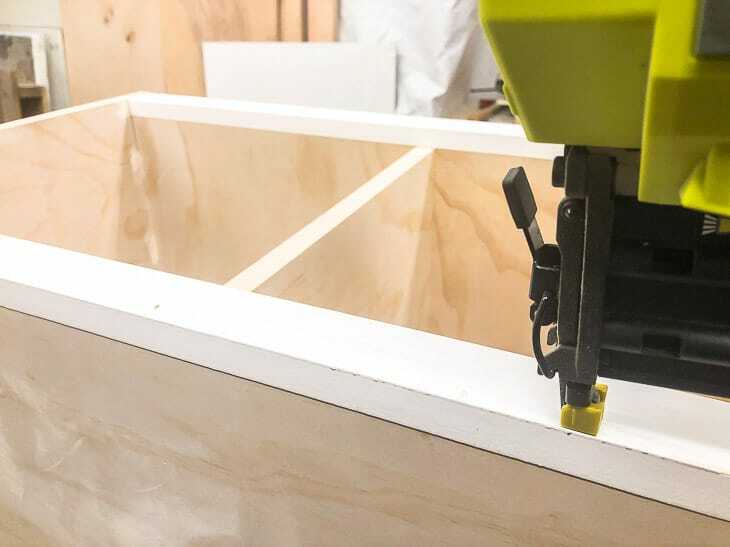 Nail the trim pieces in place with a brad nail gun and 1 1/2″ brad nails. The trim should be flush with the top and bottom pieces, as well as the front edge. Fill any holes or gaps with wood filler, then sand smooth when dry. Now it’s ready for paint! 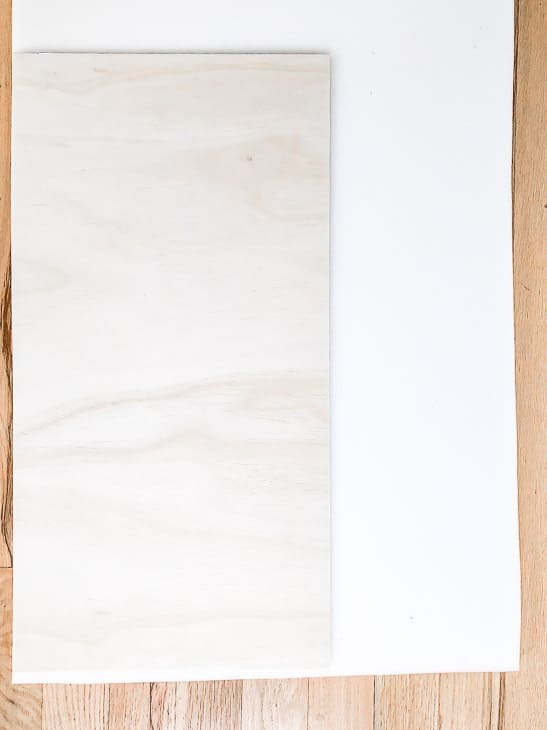 Cut the 1/4″ plywood slightly smaller than the top section of the bench (mine is 29 1/4″ x 15 1/4″). The batting and leather will fill the gap and make the cushion fit snugly. 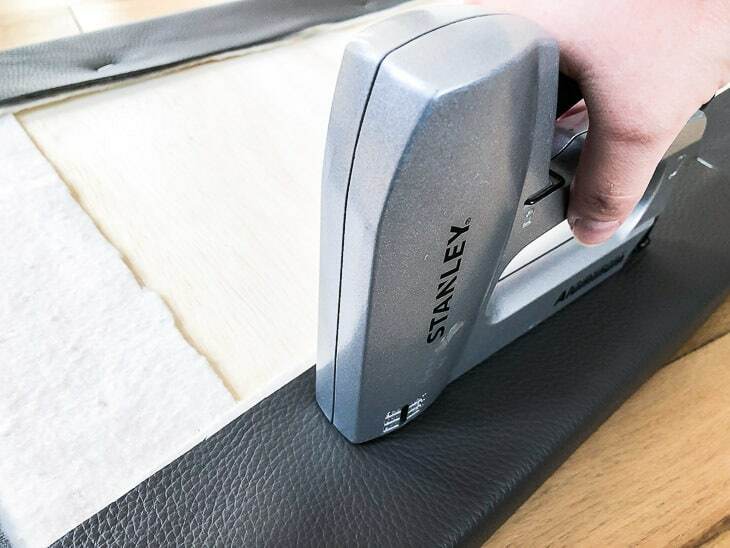 Trim the 1″ thick upholstery foam to the exact dimensions of the top of the bench. I just cut around the edge of the plywood backing. Cut the batting and leather about 4″ bigger than the foam all the way around. This gives you plenty to grab onto when pulling it taut. Don’t know how much leather to buy for your project? Leather Hide Store has a great guide here. Staple one side of the batting and leather to the plywood backing. Pull the other side taut, then staple it in place. Leave a few inches free at each corner. One benefit to working with leather is that the edges won’t fray when cut. Only the front edge of the bench cushion will be visible, so I cheated a little when creating the corners. I folded the corner over to the short end, cut the bulk from behind the fold, then wrapped it around to the bottom and stapled it in place. It took a lot of fiddling to get just right! This gave me a cleaner look on the front of the cushion, without a lot of bulk on the sides. 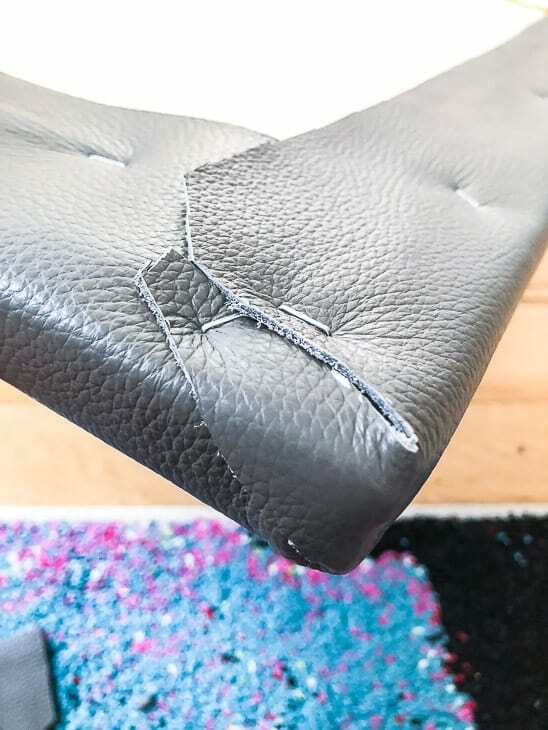 I did the same thing for the back edge, in case the cushion starts to sag over time and needs to be flipped around. Now the cushion slides into place snugly, and the raised back and sides keep it in place! Load up your DIY entryway bench! It was kind of amazing how many shoes fit into my new DIY entryway bench! All our favorites fit into the bins easily, with plenty of room for more. The cushion provides the perfect place to sit and take off your shoes at the end of the day! A huge thank you to Leather Hide Store for providing me with the gorgeous leather for this project! 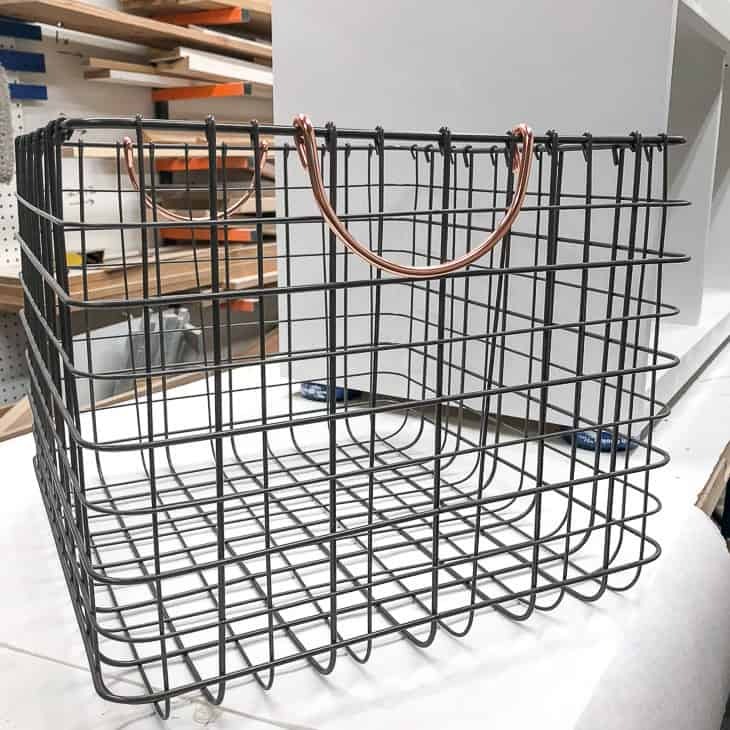 The crisp, clean lines contrast nicely with the industrial metal baskets. 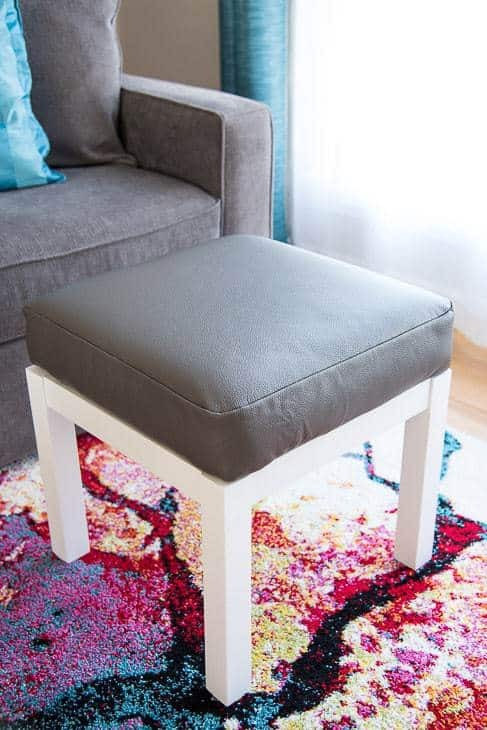 It would have been difficult to find a store-bought bench that fit their not-quite-square size, but that’s not a problem when you make your own furniture! I could totally see this as a storage bench for kids toys too! I wish I had one of these when my son was younger and toys were strewn everywhere! In the future, I plan to build a console table to go next to my new entryway bench for even more storage, so stay tuned! 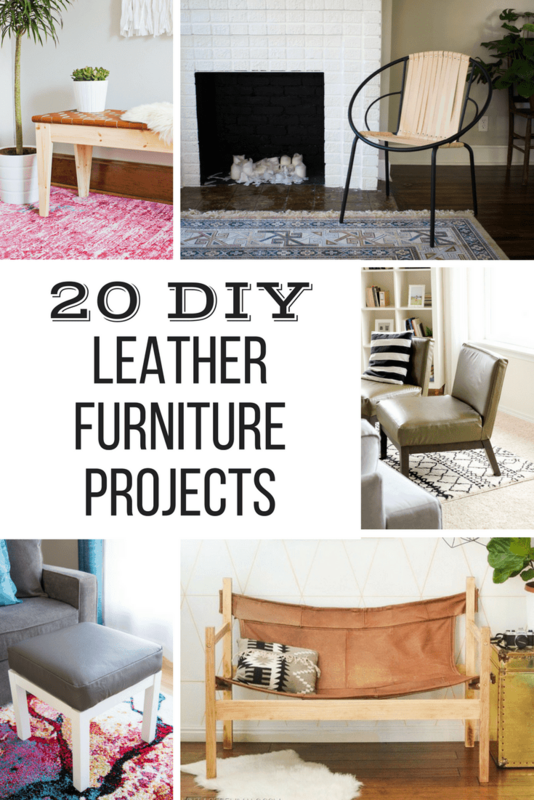 Want more DIY leather furniture projects? Try one of these! If you would like to keep up to date with my latest posts about DIY projects, woodworking and more, you can follow me on Facebook, Pinterest, or Instagram. You can also sign up for my email list below and get the latest post delivered to your inbox, plus download more plans from my woodworking plans library! I love this bench, so very fantastic! Pinned. Thanks for sharing on To Grandma’s House We Go! I’ll be featuring you next week! What a great bench! Thanks for sharing the how to’s with SYC.